Spider-Man don’t take no jive but he goes absolutely ballistic when he gets no tips. Police are charging Philip Williams, 35, with assault after he allegedly punched a 44-year-old mom in the face in Times Square yesterday. Williams/ Spider-Man became exceedingly irritated when the woman failed to tip the amazing arachnid-fool following a photo-op with her two kids. Williams allegedly belted the mother after she wouldn’t pay him for posing with her two kids, causing the woman to storm off and get her husband. But she ended up targeting the wrong Spider-Man for revenge. “A woman came to me and said, ‘What did you do to me, you f–ker?’ ” said the other Times Square Spidey, who wouldn’t give his name. An easy mistake. Times Square, nowadays, is crawling with all manner of superheroes; from the official to the unofficial to the hopelessly insane. Apparently, the current favorite is Spider-Man and droves of aspirant spider-men are spinning webs throughout the Square. 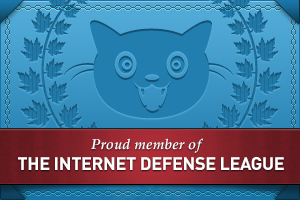 Which is yet another reason why my wife and I stay home as much as possible and keep the windows and doors tightly locked. 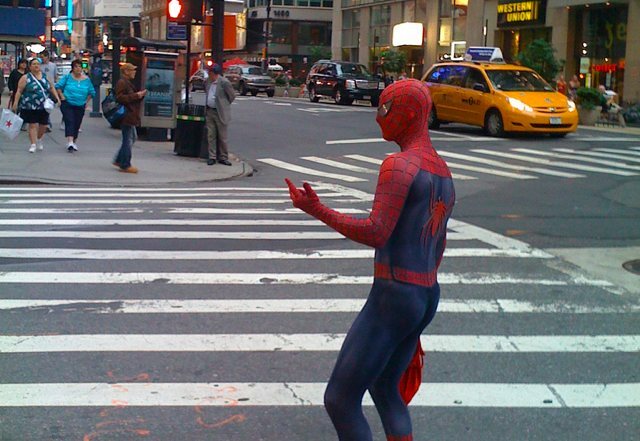 Spider-Man Allegedly Attacks Mom In Times Square: Gothamist. The New Year‘s Eve celebration in Times Square debuted in 1904 as a ceremony commemorating the official opening of the New York Times‘ new headquarters at One Times Square. Located at the triangular intersection of 7th Avenue, Broadway and 42nd Street in Manhattan, it was the second-tallest building in NYC in those days, towering over the small spot of land the newspaper named after itself. An unprecedented celebration unfolded on that distant New Year’s Eve. Adolph Ochs (the then publisher of the paper) “spared no expense to ensure a party for the ages.” Fireworks, rattles and noisemakers from over 200,000 attendees were the culmination of an entire day of street festivals. 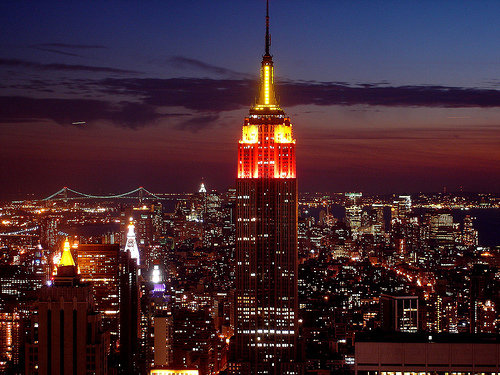 The New York Times‘ description of the occasion paints a rapturous picture: “From base to dome the giant structure was alight–a torch to usher in the newborn year….” The commemoration was quickly turned into a traditional New Year’s Eve event. The crowds at Trinity Church, then the setting for New Year’s Eve celebrations, instantly found their way uptown to a new and (down to the present day) more dynamic setting at Times Square; of course, it all became bigger and more high-tech over the years. Long before the present-day craze of fast food restaurants (Burger King, McDonalds, etc.) there was the Automat. Established by Joe Horn and Frank Hardart, the first opened on July 2, 1912 in Times Square and was an immediate sensation. Offering a vast selection of freshly-prepared food, almost everything (literally) from soup to nuts, customers would drop a nickle in a slot and select their dish from windowed compartments. You don’t usually see many llamas cruising around NYC; not even when the circus is in town. However, during its glory days of photojournalism, Life magazine oftentimes made the seldom seen a thing often seen. Inge Morath’s A Llama in Times Square first appeared in the December 2, 1957 issue of LIFE magazine. The one-page story formed part of its humorous Animals section and was entitled “High-paid llama in big city.” Showcasing various types of animals (the four-legged type, that is) living at home in a Manhattan brownstone, it was one of the magazine’s most popular articles. You have to love this city…if only for its ever-changing, always photogenic, menagerie; it’s the greatest show on earth. New York City subway in 1958. 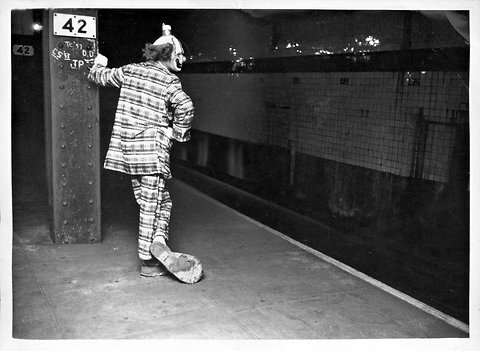 After missing the Rockaway Express as it left Times Square, Jazzbo the clown waited for the next train. I’m always delighted to learn that subway commuters haven’t changed very much over the years. What’s more, perhaps many of them were/ are actually real, and not (as I presumed they were) hallucinations. You may be happy to know that Jazzbo the Clown (see here) was very real; he’s alive and well and living in Long Island. Apparently his train finally did arrive…eventually. Nowadays, the MTA has the monopoly on clowns…more akin to Pennywise the Clown from Stephen King’s It. 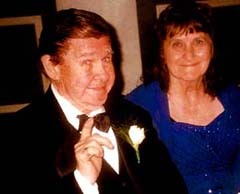 Ed Tester (sans clown make-up) and his wife, Margie, on the occasion of their 60th wedding anniversary, October 4th, 2006. The Man of Steel and The Caped Crusader were in town the other night, appearing live and in-person in Times Square, when they were approached by curious police officers. The cops believed that Superman was panhandling and, even worse, that both he and Batman had dressed up as superheroes without a license. They moseyed over to Superman (aka Clark Kent of the Daily Planet via the Planet Krypton… now aka Maksim Katsnelson, 23, of the Bronx!) and asked him to produce ID. However, when you’re Superman or Batman, not only don’t you need a badge, you certainly don’t need no stinkin’ ID. While Batman (formerly aka Bruce Wayne of stately Wayne Manor…now aka Frank Frisoli of Maine) cooperated with the police, Superman went ballistic on them. 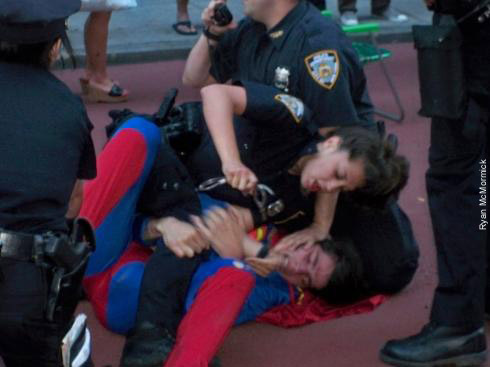 He didn’t have any ID and, when the cops continued to question him, a scuffle ensued and Superman punched the female officer who was in the hot and heavy process of arresting him. Stunned Times Square tourists and office workers watched agog as cops struggled to subdue Clark Kent’s alter ego without kryptonite….If that wasn’t weird enough, [Ryan]McCormick [a passerby] turned and saw the Dark Knight handcuffed to a chair like a common villain…. Batman (Frisoli) didn’t cause any trouble and was released. Superman (Katsnelson), on the other hand, wound up in the NYPD’s version of the Fortress of Solitude where he’ll undoubtedly be further questioned by Lex Luthor. A tourist by the name of Melba Williams reported that Batman left the scene with another superhero: “He walked off with the Statue of Liberty.” (Yikes!) However, I suspect that the excitement was just too much for poor Ms. Williams…it was probably only Catwoman. Driving Through Time Square NYC from Norris Films on Vimeo. Hypnotic, dream-like drive through Times Square. The gorgeous music is Comptine d’un autre ete (“rhyme of another summer”–my translation) from Yann Tiersen‘s film score to Amelie. Arts For Transit hosted the auditions for the MTA’s Music Under New York program [yesterday] morning, and the authority’s videographer has already produced a video from the day’s events. For my money, the best MUNY group around are the Ebony Hillbillies.